Featured paper: Synergistic anticancer films. A team of researchers from Brazilian universities developed a new film material that contains and releases, simultaneously, silver nanoparticles (AgNPs) and nitric oxide (NO) – two active substances known for their antimicrobial and anticancer activity. Tested by the scientific team, the material proved to be effective in eliminating various types of bacteria and cells from certain types of cancer. The characteristics of the film make it promising to topically treat malignant tumors or infectious lesions. The main authors of the paper: from the left, Wallace Rosado Rolim (doctoral student at UFABC), Amedea Barozzi Seabra (Professor at UFABC) and Joana Claudio Pieretti (Master´s student at UFABC). The study, recently published in ACS Applied Materials & Interfaces (Impact Factor 8.097), was developed during the Master’s research work of Wallace Rosado Rolim, guided by Professor Amedea Barozzi Seabra, and defended this year in the postgraduate program in Science and Chemical Technology of the Federal University of ABC (UFABC). The work also involved, through scientific collaborations, knowledge and experimental techniques of Biology and Biomedicine areas. “I emphasize the importance of interdisciplinarity and teamwork for the success of scientific and technological research,” says Professor Seabra, who is the corresponding author of the article. The idea of developing this biomaterial (a material planned to interact with a biological system for medical diagnostic or treatment) came up in discussions between Rolim and his advisor. “We were looking for new strategies for controlled, localized and sustained release of actives such as nitric oxide molecules associated with silver nanoparticles, for biomedical applications,” reports Professor Seabra. The scientific duo had the idea of bringing together the two therapeutic assets in a single material that was able to topically release them. “We were looking for a synergistic action of these two assets,” says Seabra. Thus, Professor Seabra and Rolim, with the collaboration of the Master’s student Joana Claudio Pieretti, endeavored to develop the material. The team was able to prepare films made from a composite material, whose matrix consists of a polymer, known as PVA, added with another polymer, called PEG, which made the matrix more flexible. Both polymers are non-toxic and biocompatible. During the preparation of the films, they added silver nanoparticles and a nitric oxide donor substance (the GSNO molecule, which, spontaneously, decompose and generate nitric oxide). In order to compare the antimicrobial and anticancer effects, the team prepared several types of films: some formed by the pure matrix (PVA/PEG), others containing silver nanoparticles or nitric oxide donors in different concentrations, and the last containing both therapeutic agents in the same matrix. After analyzing all the films using various characterization techniques to accurately determine their composition and morphology, Professor Seabra and her students studied how the release of nitric oxide and silver nanoparticles occurred. Finally, the films were sent to the collaborators from other research groups to perform the biological assays, which were performed in vitro (i.e., outside living organisms and within environments with controlled conditions). At UFABC, the groups of professors Ana Carolina Santos de Souza Galvão and Christiane Bertachini Lombello focused on the anticancer action of the biomaterial, using cervical and prostate cancer cells. On the other hand, the tests related to the antibacterial activity of the films were carried out at the São Paulo State University of Campinas (UNICAMP), by Professor Marcelo Brocchi’s group, which involved tests with several types of bacteria, including the well-known Escherichia coli and Staphylococus aureus. As a result, the synergism between silver and nitric oxide nanoparticles, which Seabra and Rolim had looked for since the beginning of the Master’s research work, was proven. In one of the assays, to cite one example, less than 25% of the cancer cells remained alive (viable) after being treated with these films for 24 hours. The material developed by the UFABC team brings the possibility of implementing a new therapeutic strategy for some cancerous tumors and infectious lesions, based on the simultaneous release of nitric oxide and silver nanoparticles, directly at the affected site, from a film. Seabra explains that “In practice, this film can be applied, for example, in a tissue (such as the skin or mucosa) or an organ, for antimicrobial or antitumor actions.” By releasing therapeutic amounts of the agents directly at the site of interest, it avoids unwanted release in healthy organs and/or tissues and thus prevents possible side effects, Seabra adds. This work received financial support from the Brazilian agencies CNPq, FAPESP and CAPES. The first author of the paper, Wallace Rosado Rolim, developed his master’s research work with a grant from UFABC. Deadline for applications: December 30th, 2018. Expected starting date: February or March/2019. Applications are invited for a post-doctoral position supported by the State of Sao Paulo Research Foundation (FAPESP-Brazil) in experimental condensed matter field. This fellowship is part of broader Thematic project “Interfaces in materials: electronic, magnetic, structural and transport properties” under the coordination by Prof. Adalberto Fazzio (LNNano, CNPEM – Campinas). The postdoctoral supervisor will be Prof. Dr. Gustavo Dalpian in collaboration with Prof. Dr. Jose Antonio Souza at the Federal University of ABC (UFABC), Santo André – São Paulo. We intend to develop research on the synthesis and physical properties characterization of Halide Perovskites. Applicants are required to have good experimental knowledge on synthesis and/or physical properties characterization of halide perovskites in the form of nanostructures and/or thin films and/or heterostructures and/or quantum dots and/or bulk. The research will be developed at the Federal University of ABC – Campus Santo André. The opportunity is open to both Brazilian and foreign candidates with a PhD degree, in Brazil or abroad, in areas related to the proposed subject. It is mandatory that the candidate has international experience, as well as publications in the areas related to the project in journals of relevant worldwide impact. At least two recommendation letters, in English, which should be sent directly to the email with the subject “Fellowship PD – Recommendation Letter”. The implementation of the scholarship is conditioned to the approval of the candidate selected by FAPESP. If the decision is approved by FAPESP, the selected candidate will receive a scholarship in the amount of R$ 7,174.80/month and a technical reserve equivalent to 15% of the annual amount of the scholarship, destined to only carry-out expenses directly related to the research activity. More information on the scholarship can be found at: www.fapesp.br/bolsas/pd. The candidate should send all the documentation to the electronic address cited above under the title “Fellowship PD – Application”. The deadline for submissions is 02/01/18. Only applications in which all the documents (including recommendation letters) are received by midnight 02/01/2018, Brasília time (UTC-3, Brazilian summer time) will be considered. (Português) Processo seletivo para o mestrado acadêmico em Ciência e Engenharia de Materiais da UFABC. (Português) Concursos para docentes em Engenharia de Materiais na UFABC (SP). (Português) UFABC abre inscrições para Pós-Graduação em Nanociências e Materiais Avançados. 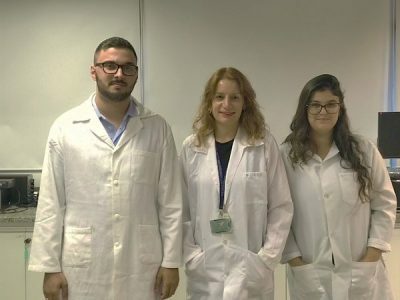 UFABC abre inscrições para Pós-Graduação em Nanociências e Materiais Avançados. O aumento da importância e competitividade tecnológica no domínio de nanomateriais e na ciência de materiais é reconhecido como um dos grandes pilares do desenvolvimento científico, tecnológico e social no século XXI. A possibilidade de desenvolver moléculas e materiais que podem substituir os materiais tradicionais terá um profundo impacto em muitos aspectos do desenvolvimento de diversos produtos. O campo emergente de materiais funcionais é, portanto uma tecnologia estratégica para o futuro. Diante desta realidade o programa de Pós-Graduação em Nanociências e Materiais Avançados da Universidade Federal do ABC (UFABC) busca capacitar profissionais com formação interdisciplinar que apresente uma visão abrangente e diferenciada, qualificando-o para a pesquisa de ponta e as inovações tecnológicas nas áreas do programa. As inscrições para o processo seletivo para o Mestrado e Doutorado estão abertas até o dia 24 de Junho.